Guy Savoy is a true “star”, who earned his first Michelin star in 1981 one year after opening his restaurant, his second star in 1985, and his third star in 2002. 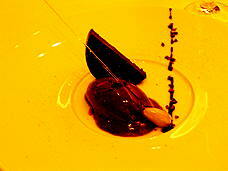 I cannot think of Paris, France without associating it with gastronomy on a grand scale. In November 2004, Edward Nesta and I had the extreme pleasure of having lunch at Guy Savoy’s restaurant, aptly named, Guy Savoy, (www.guysavoy.com). He is a true “star”, who earned his first Michelin star in 1981 one year after opening his restaurant, his second star in 1985, and his third star in 2002. He continues to surprise and delight with his creations. The ambience is one of contemporary elegance with gorgeous paintings and sculptures, and where the art overflows to his imaginative selection of table settings and china, which change with each course. 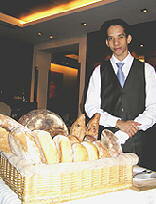 The staff is attentive, with flawless service without an attitude, something rarely seen at some restaurants these days. Elegance abounds at Guy Savoy, where Arnaud, the Sommelier asked us if we would like an aperitif before our lunch, which he offered from a multi-level drinks cart. We began with an aperitif of Guy Savoy champagne, which had a luscious pale yellow color with a fine stream of bubbles, with a nose of spring flowers and pears, and was delightful en bouche. An amuse bouche of fois gras and toast was served on a miniature silver pick, followed by a small glass of cream of mushroom soup with chive oil, accompanied by three pieces of fois gras on baby endive for Edward, and for me, miniature vegetables on an herb leaf. To accompany our next courses, Arnaud selected a phenomenal Les Pommards “Daniel Barraud” 2000, a Saint Véran, 100% chardonnay, 13 % alcohol, which was pale gold, and perfectly complemented the mussels and mushrooms in a foam sauce. 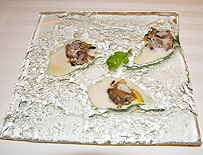 Presentation of this exceptional course was a beautiful square glass plate with special indentations to hold three mussels and mushrooms. This savory dish was a definite hit, which had us wishing we could have had more. Fois gras with truffles with a shallot vinaigrette followed for Edward, and for me, a colorful plate of baby vegetables including Jerusalem artichokes, potatoes, parsnips, vegetable crisps of parsnips and beets, and a carrot puree topped with a poached egg. When Edward finished his fois gras, the waiter removed the top of the plate, where he revealed a wonderful surprise of duck consommé with leeks and mushrooms in the bowl below. Gregory, in charge of the bread service, tempted us with a bread cart laden with all types of delicious breads, which he insisted that we try a new selection with each of the courses, and of course, we did. Two perfectly sautéed large scallops, golden with a slightly crispy exterior, yielding a delicate and sweet interior were served with a parsley sauce and parsnip crisps. The wine, which had been decanted, continued to improve, and was very well balanced and paired beautifully with the scallops. Our next surprise came in the form of a very large pumpkin, which was wheeled on a cart to our table. The top of the pumpkin was lifted off to reveal a bowl of creamy pumpkin soup, which was carefully ladled into our bowls, and then topped with shaved truffles which was pure magic, and we were enchanted by each spoonful. The specialty of the restaurant, an artichoke soup with black truffle and shaved cheese followed, accompanied by a warm half of a mushroom brioche which was spread with truffle butter at our table, was so incredibly decadent, that I was purring with delight. For our next courses, yes, there were more, the Sommelier selected a Chateau Bellegrave Pomerol, 1997, 12.5% alcohol, which he decanted. It was the perfect accompaniment to Edward’s pigeon and fois gras with truffles, mache, walnuts, pumpkin puree and parsley puree, and my red snapper which was 2 pan-fried filets with juice and baby eggplant with chive and sage butter, which was paired with a plate of buttery, crisp thinly sliced potatoes. Gregory appeared again, this time pushing a multi-level cheese cart, which had an amazing selection of over 25 cheeses. We worked our way through only a small percentage, alas, but that leaves us something to look forward to on a future visit. Now for the sweets! A warm raisin with chocolate wrapped in a thin layer of phyllo dough and twisted like a candy wrapper was our first sweet treat. Another small silver pick followed, this time with a small cube of coconut brioche and a cube of pineapple served on a small plate on top of a bed of pineapple sauce. Warm miniature Madeleines followed, and then we were tempted with melt-in-your-mouth lemon marshmallows, of which I had to try several. To accompany our desserts, the Sommelier selected a Ben Ryé, Passito di Pantelleria 2001, 14.5% alcohol, which was a beautiful rich deep amber color. Late harvested Muscat grapes, sun-dried under volcanic rock elicited their unique flavor due to the terroir. Smooth as velvet, with essence of honey, peaches and ripe apples en bouche. A citrus fruit terrain of orange and grapefruit was delightfully refreshing, and was served on a black plate with a maple leaf shaped cookie, signaling that autumn had arrived. A dessert cart magically appeared and offered more tasty treats to sample. We tried the rice pudding, which was rich and creamy, a crème caramel and a sinfully delicious chocolate mousse. Another dessert followed, this time, it was bitter dark chocolate ice cream with a spun sugar straw with an almond at the end, and a half of an equally dark and bitter chocolate torte, which we had to finish every bite. A palate cleanser of Earl Gray sorbet with a black pepper sauce followed, which had an unusual and refreshing taste, which left my tongue tingling, and my mouth exhilarated after a magnificent lunch. Espresso followed so we wouldn’t fall asleep at the table, and of course, more miniature sweets and pastries appeared which of course, we had to sample. On the way out, we were offered wrapped nougats, so that we would leave the restaurant on a sweet note. Bravo, Guy Savoy, you have earned your 3 Michelin stars, and deserve every one! Read our other articles on Paris in Destinations, Hotels & Resorts, and Restaurants sections.